Reactions to the pope’s “offering” were rather predictable. Radical Traditionalists (also known as “Catholics”) bristled at the sight of the Holy Father (good intentions aside) placing profane objects adjacent to the tabernacle on the altar of Rome’s largest, and best known, Marian church. If the pope had tucked a beach ball into the Blessed Mother’s hand on Michelangelo’s Pietà, would that have been equally as charming? If the image below is disturbing (and God knows it should be), what Pope Francis actually did should be exponentially more troubling still. And yet, I am certain that there are still those who would take a different view. If you’re one of them, please, make your case. I’m interested in hearing it. When I was a very young boy, my family made a pilgrimage to the Basilica of Our Lady of Guadalupe. I had a rubber duck that I loved and I gave it to our Lady, seeing how so many pilgrims were leaving all sorts of things for her. I remember that offering fondly and with a sense of innocent devotion. 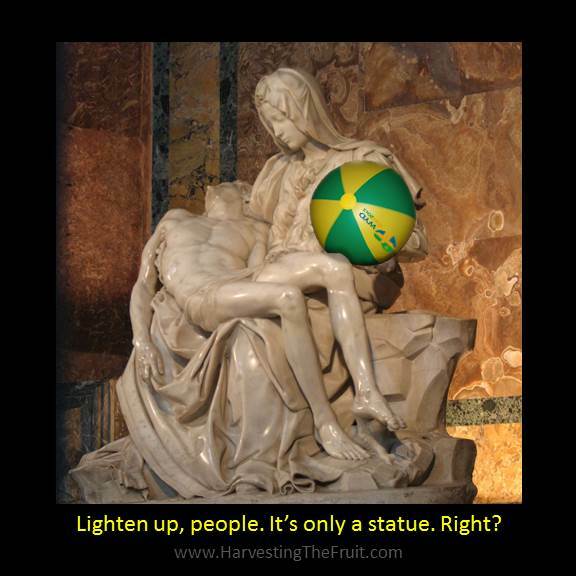 Right–the Pieta, no matter how moving or inspiring it may be, is only a statue. It would be inappropriate to offer gifts to a statue, but bringing the gifts of children to our Mother in the presence of her Son can never be sacrilege. I pray that you can set aside your wrath before bringing your own gifts to the altar, because you are my brother. Physical object offerings are an abomination as they mock the only true, substantial and omnipotent sacrifice of the Christ, offered on the cross and on the altar at each mass. What can God do with a beachball and how is it worthy to take place beside the Body, Blood,Soul and Divinity of Our Lord Jesus Christ? Even if you think that it is appropriate to offer this it is surely indefensible that it was placed on the altar in the Real Prescence of God Himself. A Pope that does not realise this is lacking is wisdom and spiritual insight. On the other hand, if the Pope knew exactly what he was doing, it is a very scary time to be living in indeed. Ask yourself, does this gesture reinforce the reverence that is owed to the Blessed Sacrament, or does it diminish it? @Ireland, Amen to that. As far as I’m concerned, it’s outrageous. Completely inappropriate. I don’t know what to think ~ is this man lacking in wisdom and spiritual insight or is it worse than that? Good grief. A bishop instructed Monica, Augustin’s mother to stop placing material offerings at the door of the Church, in the book Confessions. Monica stopped this practice immediatly and was glad that the Bishop had instructed her. I believe it was on the grounds of being pagan practice. I can see placing religious or blessed objects at a shrine or something, but this is a little odd. Is it totaly wrong? I don’t know, but I also don’t personally know anyone who would do it. Instead of a beach ball, offer up a prayer or an annoyance, as a form of petition. When Francis refused to give the Angelus blessing right after he was elected, I knew we would experience “interesting” times. Jacob himself wrestled the Angel ALL night to get His blessing. If I had been in that Wednesday audience, I would have been furious to have been denied that blessing. How can a Pope refuse a blessing to his flock? Great article. The first thing that came to my mind were the offerings of the three wise men. 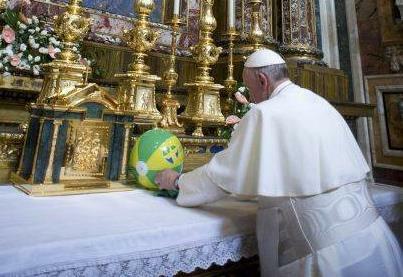 They gave Christ precious gifts, and our Pope gives Him a beach ball and soccer jersey. What is most striking it’s the immense inanity of the act. And sorry if I’m coming off as a sour trad, but I think this is disrespectful to our Lord, and possibly a sacrilege. We need to read the story of Cain and Abel again.